Would one of you please show “The Clock”? It’s hard to believe this work of art from 2010 — celebrated by critics, unbelievably ambitious and staggeringly impressive — has traveled to at least a dozen cities but has yet to appear in Chicago. 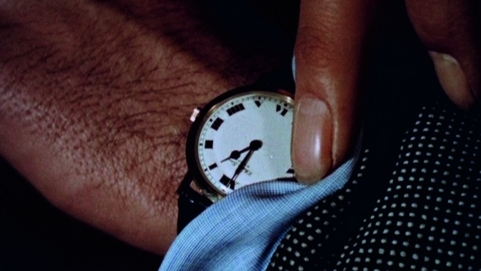 Last week, I followed the advice of the Chicago Tribune’s Christopher Borrelli and took a trip to Minneapolis, where the Walker Art Center was showing “The Clock.” Christian Marclay’s 24-hour-long video collage pulls together thousands of clips from movies throughout history, most of them showing a clock or watch displaying the same time at that very moment of the day in the world outside the video screen. 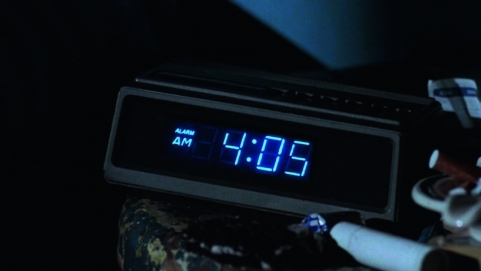 In other words, if you’re watching “The Clock” at 4:05 a.m., you’ll see a scene from a movie in which it’s 4:05 a.m.
That’s the gimmick, but “The Clock” is far from gimmicky. If you saw just a few minutes of it, you might think, “Well, that’s clever.” But then, if you keep on watching, the experience becomes strangely compelling. 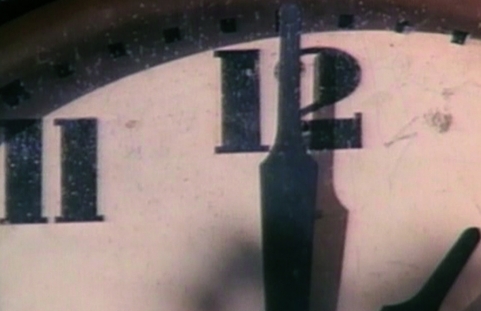 Somehow, even though “The Clock” lacks anything resembling a traditional narrative, it keeps you glued to the screen. After a while, it becomes deeply moving and resonant, feeling like a portrait of humanity, of people from scattered places and eras, all progressing through the rhythms of one day. And it also functions like a history of filmmaking and acting styles, a commentary on how editing plays with our perceptions — and a masterful job of editing, too. In 2012, The New Yorker published an excellent article about Marclay and “The Clock” by Daniel Zalewski, which explains the painstaking process Marclay used to create this stunning piece. In some cities where “The Clock” has been shown, people waited in lines to get into the screening room. There were no lines at the Walker during my three visits, though the room frequently got crowded, with people standing in the back or sitting on the floor. Shortly after arriving in Minneapolis on a Thursday, I went to the museum and watched “The Clock” from 6:22 p.m. until shortly before the museum closed for the night at 9 p.m. The following day, I returned and watched from 11:35 a.m. to 2:05 p.m. and 2:25 to 5 p.m. — when the museum closed for the night. Saturday was one of the days when the Walker kept the gallery open around the clock, so I returned around 8:30 p.m. (watching the next half-hour or so for the second time) and stayed until 1:30 a.m. So, all together, I ended up watching slightly more than half of “The Clock.” And now I regret not staying for longer, as the film continued to reel into the early-morning hours. And I wonder: When will I get a chance to see it again? In his Tribune story, Borrelli reported that a curator at Paula Cooper Gallery in New York, which represents Marclay, “told me there have been no serious negotiations with any local museum or gallery to bring it to Chicago.” Really? If it doesn’t come to Chicago, I hope it gets a showing in another city I can visit. How about a permanent installation somewhere? 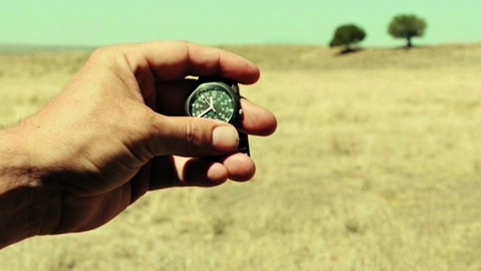 It doesn’t seem quite correct to label “The Clock” as a film; it certainly isn’t a traditional example of a movie. But the act of watching “The Clock” inside the dark gallery is essentially a moviegoing experience. 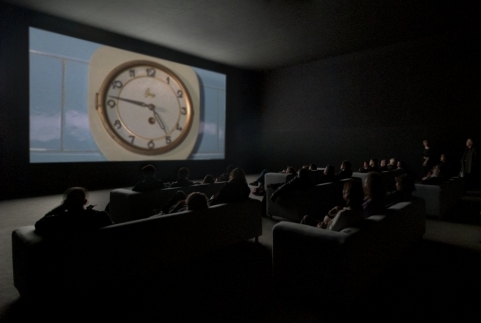 However it is categorized — as video art, an installation or as a film — “The Clock” is one of the definitive artworks and most amazing viewing experiences of our time. Do not miss it if you get the chance. Photos from the White Cube website.